One small step — It’s the 49th anniversary of the first moon landing, and we have to say we expected to be vacationing on the moon by now. It’s a good reminder not only that great things are possible, but also that progress is not an uninterrupted trajectory. Trust, but verify — Sometimes it takes a while to test a claim. 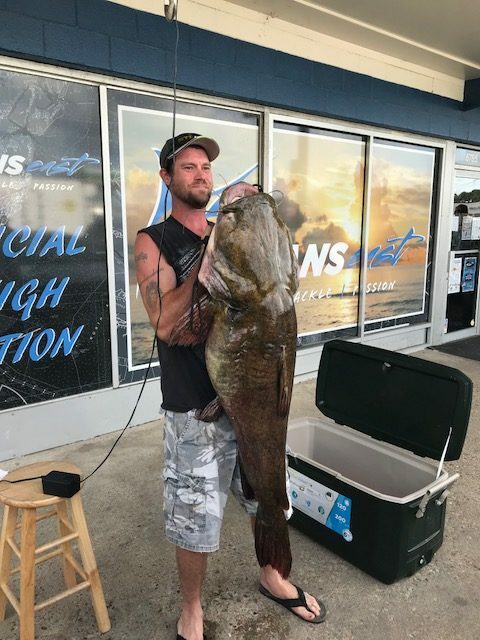 The Virginia Department of Game and Fisheries confirmed this week that a flathead catfish caught in Virginia Beach in May is the largest on record, at 68 lbs. 12 oz. Handsome, isn’t it? House passes growth/regulatory reform package — The House voted 406-4 on Tuesday to pass the JOBS and Investor Confidence Act of 2018, a package comprising 32 individual bills aimed at helping small businesses, entrepreneurs, and investors. The bill includes measures to ease regulations on angel investors, expand the definition of “accredited investors,” and extend the on-ramp exemptions for emerging growth companies. A summary of the bills included in the package is here. FTC wants authority for rulemaking, civil money penalties on data security — The five members of the Federal Trade Commission appeared before the House Committee on Energy and Commerce for an oversight hearing on Wednesday, the first since Chairman Joseph Simons took office. The hearing focused on the FTC’s role in protecting data security and privacy, and the commissioners told the committee that they need rulemaking authority and the ability to levy civil money penalties in this area. Chairman Simons also called for a repeal of current exemptions for nonprofit organizations and common carriers. The FTC will hold a series of hearings this fall on Consumer Protection in the 21st Century. Fed continues slow move back to normal, says Powell — In appearances before the Senate Banking Committee and the House Committee on Financial Services this week, Federal Reserve Board Chairman Jerome H. Powell said that the Fed would continue to adjust interest rates in pursuit of its targeted 2% inflation rate, and that it will continue to unwind its balance sheet. Powell was optimistic about the economy, though he said that its continued health will depend on the outcome of trade disputes; he reported “a chorus of concern” about tariffs from the Federal Reserve Banks. Powell said that housing finance reform remained the last piece of unfinished business, and that it was important to get the housing finance system off the federal government’s balance sheet as soon as possible. Quarles promises tailoring beyond asset size — Federal Reserve Board Vice Chairman Randal K. Quarles told an American Bankers Association meeting this week that the Fed believes tailoring financial regulation is good public policy, and that they’re evaluating criteria for tailoring beyond asset size. Tailoring is central to the recently enacted Economic Growth, Regulatory Reform and Consumer Protection Act (EGRRCPA), and the Fed has already begun to implement changes required by the law. Quarles said that they will move much more quickly than the law’s 18-month deadline, especially in providing relief to banks between $100 million and $250 million that are not deemed systemically important. Time for a comprehensive review of capital requirements — The House Financial Services Subcommittee on Financial Institutions and Consumer Credit heard testimony Wednesday from regulatory experts who called for a comprehensive review of bank capital requirements, with a view toward streamlining them, making them more subject to market discipline, and giving boards more authority over capital distribution. All the witnesses agreed that the stress testing process should be more transparent, and that the "mono-model" of testing to one specific set of circumstances was not the best measure of a bank's resiliency. Former Acting Comptroller Keith Noreika was particularly critical of the application of enhanced prudential standards to foreign banking offices in the US regardless of size, and said this probably violates the standard of national treatment. Kraninger grilled at Senate confirmation hearing — Yesterday’s Senate Banking Committee confirmation hearing reviewed Kimberly Reed’s nomination to be President of the Export-Import Bank as well as that of Kathleen Kraninger to be Director of the Bureau of Consumer Financial Protection. Kraninger got almost all the attention, though, as Committee Democrats questioned her role in the OMB’s participation in hurricane relief and the family separation policy. Committee Chairman Mike Crapo (R-ID) said he was confident that Kraninger would be sufficiently vetted, although the White House had not delivered thousands of documents requested by Committee Democrats. Kraninger pledged to uphold the law, and said she would apply her experience in delivering common-sense solutions to complex problems. Chairman Crapo said he plans to schedule a vote on the nominations late in the week of July 26. Is cryptocurrency the future? — A House Financial Services subcommittee heard testimony Wednesday about the potential role of digital currency in domestic commerce and international trade. While central banks in Tunisia and Ecuador are already issuing digital currency, the Federal Reserve has no plans to do so. Cash is still the preferred medium of exchange in the United States, especially for small-dollar transactions, but Sweden, for example, has moved overwhelmingly to a mobile electronic payment platform. On a global level, however, the U.S. dollar remains the world’s reserve currency, and that is not likely to change any time soon. Federal Reserve Board Chairman Jerome H. Powell told the House Financial Services Committee yesterday morning that cryptocurrency “doesn’t really have any intrinsic value,” and that the Fed doesn’t want authority over it. Treasury and the SEC would handle it, he said—Treasury creating the regulatory framework, the SEC handling investor protection. Threading the needle on China trade — China’s unauthorized technology transfers and intellectual property theft present threats to both the economy and national security, witnesses told the House Permanent Select Committee on Intelligence at a hearing yesterday. Chinese investment in the US is often beneficial, however, and business relations between the countries are too intertwined for this to be seen as a second cold war. Witnesses emphasized the need for American businesses to intensify their own innovations, while protecting their data and intellectual property. SEC approves disclosure rules for “dark pools” — The Securities and Exchange Commission voted Wednesday to approve amendments to Regulation ATS to enhance operational transparency and regulatory oversight of Alternative Trading Systems (ATSs) that trade on a national exchange. The Commission approved a new Form ATS-N that requires an NMS Stock ATS to report information about its manner of operations and the ATS-related activities of the broker-dealer that operates the ATS and its affiliates. The rules will take effect 60 days after publication in the Federal Register. Mulvaney reorganizes BCFP to focus on innovation, names fintech chief — Mick Mulvaney, Acting Director of the Bureau of Consumer Protection, announced Wednesday that he has named Paul Watkins to head the agency’s new Office of Innovation, recently established to encourage consumer-friendly innovation. “The new office will focus on creating policies to facilitate innovation, engaging with entrepreneurs and regulators, and reviewing outdated or unnecessary regulations,” the Bureau says. Watkins was responsible for fintech initiatives at the Arizona Office of the Attorney General, where he managed the nation’s first state fintech sandbox. He previously practiced law in northern California. He is a graduate of Hillsdale College and Harvard Law School. FSOC proposes lifting Zions’ SIFI designation — The Financial Stability Oversight Council (FSOC) announced this week that it has proposed a decision to grant Zions Bank’s appeal of its designation as a systemically important financial institution. The decision is conditional upon the merger of ZB, N.A. into its nonbank affiliate, which the FDIC approved earlier this month. July 24 House Financial Services Committee marks up H.R. 1511, the “Homeless Children and Youth Act of 2017;” H.R. 2069, the “Fostering Stable Housing Opportunities Act of 2017;” H.R. 2570, the “Mortgage Fairness Act of 2017;” H.R. 3626, the “Bank Service Company Examination Coordination Act of 2017;” H.R. 5036, the “Financial Technology Protection Act;” H.R. 5059, the “State Insurance Regulation Protection Act;” and H.R. 6332, the “Improving Strategies to Counter Weapons Proliferation Act.” 10:00 a.m., 2128 Rayburn House Office Building. July 24 House Committee on Small Business holds a hearing on investing in rural America. 10:00 a.m., 2360 Rayburn House Office Building. July 24 House Committee on Science, Space, and Technology holds a hearing on “Urban Air Mobility — Are Flying Cars Ready for Takeoff?” 10:00 a.m., 2318 Rayburn House Office Building. July 24 Senate Committee on Banking, Housing, and Urban Affairs holds a hearing on the nominations of Elad Roisman to be a member of the Securities and Exchange Commission; Michael R. Bright to be President of the Government National Mortgage Association; Rae Oliver to be Inspector General of the Department of Housing and Urban Development; and Dr. Dino Falaschetti to be Director of the Treasury’s Office of Financial Research. 10:00 a.m., SD-538 Dirksen Senate Office Building. July 25 FDIC and OCC host the 2018 Joint Mutual Forum to promote the operations of mutual depository institutions and discuss industry trends. 8:30 a.m. – 3:45 p.m., OCC Headquarters, 400 7th Street, SW. The ballot initiative that would have divided California into three separate states, and created an additional four Senate seats under a modified US state map over a long process, will not be voted upon. Though the initiative qualified for the ballot in terms of valid petition signatures, the California State Supreme Court late this week ruled the initiative question unconstitutional. Therefore, the proposition dies before voters have their say. Michigan: National Research, polling for the non-connected Outsiders PAC (7/11-14; 600 MI likely Republican primary voters), finds venture capitalist Sandy Pensler leading retired Army Ranger and manufacturing company owner John James, 28-21%, with still a huge 41% undecided as the candidates enter the final days of the Republican primary campaign. The Michigan primary will be held August 7th. The winner faces Sen. Debbie Stabenow (D) in the general election. Missouri: The Missouri Senate race may arguably be the most topsy-turvy race in the country so far this year. Most polls have shown just a small lead for one contender or the other but, in most, Sen. Claire McCaskill (D) has enjoyed a slight advantage. Earlier this week, the Remington Research Group released its new Show Me State survey for the Missouri Times news site (released 7/10; 1,034 MO registered voters via automated response device) that finds Attorney General Josh Hawley (R) again claiming the lead, with a slim 48-46% edge over Sen. McCaskill. We can expect this race being rated a toss-up all the way to Election Day. Montana: Early last week, Axios Media/Survey Monkey released polls of 13 Senate races that included Montana. The SM study found Sen. Jon Tester (D) opening up a substantial 55-42% lead over state Auditor Matt Rosendale (R). Just as the week closed, the Remington Research Group (7/8-10; 2,581 MT likely general election voters) published their new survey that shows Mr. Tester holding only a 49-46% advantage. Polling has given Sen. Tester consistent leads and larger margins than Remington detected in their latest study. Therefore, more data will be needed to determine if the Remington results are detecting a new trend or putting forth outlier data. New Jersey: A new Gravis Marketing poll for the Breitbart News site (7/6-10; 563 NJ likely voters) finds former pharmaceutical executive Bob Hugin (R) pulling to within a 43-41% margin of Sen. Bob Menendez (D) despite heavy advertising attacking the former man for prices and availability of various life-saving medication. Hugin, who has loaned at least $7.5 million of his own money to his campaign, has countered with his messages attacking Sen. Menendez over ethics. The reference, of course, is the Grand Jury indictments brought against the Senator that resulted in a hung jury, dismissal of charges, and finally the government folding their case. Tennessee: A series of four Tennessee Senate polls were released within the July 2-14 period, and both Rep. Marsha Blackburn (R-Brentwood) and former Gov. Phil Bredesen (D) find public data projecting them as the race leader. As we covered last week, the Axios Media Survey Monkey poll (6/11-7/2 (for their 13 state polls); 1,010 TN registered voters) found Rep. Blackburn leading definitively at 55-41%. This was followed by a WPA Intelligence poll (7/9-11; 551 TN likely voters) that found her ahead, but with a more pedestrian 38-35% margin. Public Policy Polling simultaneously released their data (7/10-11; 583 TN likely voters) that saw Mr. Bredesen up 44-41%. Now, Emerson College publishes their Tennessee poll (7/11-14; 657 TN likely voters) that projects Bredesen to an even larger 43-37% advantage. Combined, this tells us that we have no clear current leader at the present time. Mr. Bredesen has the statewide name identification and positive image advantage, while Rep. Blackburn’s solid conservative base and Tennessee’s voting history since the former Governor left office are the key points in her favor. West Virginia: The Trafalgar Group (7/13-16; 1,158 WV likely general election voters) released their latest poll, and the ballot test confirms what other pollsters have also been reporting. According to Trafalgar, Sen. Joe Manchin (D) leads Attorney General Patrick Morrisey (R), 50-40%. This is the first reported poll that has tested what happens if the incumbent votes either for or against Supreme Court nominee Brett Kavanaugh. Should Sen. Manchin vote for Kavanaugh, his support margin soars to 59-30%. If he chooses to oppose the judge, the race becomes a toss-up at 47-45%. Wisconsin: The Marquette Law School is back with their latest poll (7/11-15; 800 WI registered voters; 305 likely Democratic primary voters; 216 likely Republican primary voters) that tested the Wisconsin Republican primary where voters will determine on August 14th who advances into the general election to face Sen. Tammy Baldwin (D). According to the results, state Sen. Leah Vukmir (R-Brookfield), who has Gov. Scott Walker’s support along with many other state Republican leaders, has a very slight 34-32% edge over businessman Kevin Nicholson. AL-2: Four-term Alabama Congresswoman Martha Roby (R-Montgomery) easily turned back a Republican run-off challenge from former US Representative and ex-Montgomery Mayor Bobby Bright, on Tuesday. The Congresswoman scored a 68-32% victory, winning in all 15 of the 2nd District’s counties. The run-off turnout exceeded 71,000 Republican voters. The race was a re-match of the 2010 general election when Ms. Roby unseated then-Rep. Bobby Bright, who at the time was a Democratic incumbent. Rep. Roby appears secure for the general election. She now faces business analyst Tabitha Isner, who won the Democratic nomination outright on June 5th. Ms. Isner reported having less than $90,000 in her campaign account on the just-released June 30th Federal Election Commission campaign disclosure report, however. CA-48: A new Monmouth University poll surveyed the Republican Orange County 48th District that Rep. Dana Rohrabacher (R-Costa Mesa) has held since 1989. According to the MU data (7/11-15; 402 CA-48 registered voters), Democratic challenger Harley Rouda, a businessman, has crept into a 46-43% lead over the Congressman. Though this district features a Republican registration advantage of 40-30%, the race has evolved into a toss-up largely because of seemingly favorable comments that Mr. Rohrabacher has made about Russian President Vladimir Putin. CA-49: Contradicting polls were released about this southern California congressional campaign between Board of Equalization member Diane Harkey (R) and attorney Mike Levin (D) this week. The two are battling to replace retiring Rep. Darrell Issa (R-Vista). Several days ago, the Feldman Group (6/24-27; 400 CA-49 likely voters with a 200 person oversample of those who register No Party Preference) found Mr. Levin leading the race on a 44-41% count, which expanded to 49-46% when those who responded that they are leaning to one candidate or the other were added. The new Harkey Campaign poll, from Public Opinion Strategies (7/15-16; 400 CA-49 likely voters), reports their candidate claiming a similar three-point lead, 46-43%. Ms. Harkey, hailing from Orange County, leads in the Orange County section 53-42%, and just 44-43% in the dominant San Diego County segment. FL-6: Rep. Ron DeSantis’ (R-Palm Coast/Daytona Beach) is leaving a dead heat Republican primary in his wake as he mounts a statewide campaign for Governor. According to a new St. Pete Polls survey (7/18; 477 FL-6 likely Republican primary voters via automated response device), a virtual three-way tie exists for the Republican nomination. According to St. Pete, former state Rep. Fred Costello, retired Naval officer John Ward, and businessman and retired Army Green Beret Michael Waltz, record respective support figures of 21-20-20%, which looks to be the closest three-way contest anywhere in this national election cycle. The Florida primary is August 28th, and the outcome is obviously in doubt. HI-1: Former Congressman Ed Case (D-HI-2) may be coming back. Mr. Case was first elected in a 2002 special election, but decided to launch an ill-fated Democratic primary challenge to Sen. Daniel Akaka in the 2006 Democratic primary instead of continuing his career in the House. Mr. Case has since attempted another run for the US Senate and entered a 2010 special congressional election for the 1st District. Before coming to Congress, he had lost a gubernatorial campaign. Now a new Mason-Dixon Polling and Strategy survey (7/6-11; 244 HI-1 likely Democratic primary voters) signals that Mr. Case may be returning to the winning track. According to the data, he leads the field of five Democratic opponents with 36%. Lt. Gov. Doug Chin is second with 27%, ahead of state Sen. Donna Mercado Kim (14%), and three others who fail to reach 10% support. The Hawaii primary is scheduled for August 11th. Florida: In June, five Florida statewide polls from five different pollsters all projected Agriculture Commissioner and former US Rep. Adam Putnam (R) to be leading US Rep. Ron DeSantis (R-Palm Coast/Daytona Beach). Now, five current July polls show the exact opposite. From the surveys released during the July 2-17 period, Rep. DeSantis posts advantages of six to 20 points from five different polling firms. 1982 Polling, for the DeSantis Campaign, Remington Research, Fabrizio, Lee & Associates, Gravis Marketing, and St. Pete Polls, find DeSantis now leading Putnam from a low margin of 35-29% (Gravis Marketing; 7/13-14; 905 FL likely Republican primary voters) to a whopping 20-point spread from St. Pete Polls (50-30%; 7/16-17; 1,709 FL Republican registered voters via automated response device). The results represent a stunning turnaround, but more than a month remains in this explosive campaign. The Florida primary is August 28th. Georgia: Controversy has surrounded Lt. Gov. Casey Cagle soon after he finished first in the May 22nd Republican gubernatorial primary. In a telephone conversation with fourth place finisher Clay Tippins, one that the latter man secretly taped, Mr. Cagle admitted he supported a particular piece of legislation simply for political reasons. He believed supporting the bill in question would head off opponents’ spending against him in the Governor’s race. Once his comments were released to the media, the voter reaction became what one would expect. After finishing first with a 39-26% margin over Secretary of State Brian Kemp, a new Opinion Savvy poll for the local Atlanta Fox News affiliate (7/17-18; 466 GOP likely run-off voters) sees Mr. Kemp outpacing Lt. Gov. Cagle, 55-37%, which is the biggest spread between the two candidates since primary election night. Additionally, President Trump has just officially endorsed Mr. Kemp, and Vice President Mike Pence is coming to the state to campaign for him over this weekend. The Georgia run-off election is Tuesday, July 24th. Hawaii: Mason-Dixon Polling & Strategy released a new survey (7/6-11; 494 HI likely Democratic primary voters) that finds Gov. David Ige pulling ahead of his Democratic primary challenger, US Rep. Colleen Hanabusa (D-Honolulu), for the first time. The new M-D numbers find Gov. Ige now ahead 44-40%. This is a highly significant finding because it was Mason-Dixon, in March, who found Ms. Hanabusa forging a commanding 47-27% advantage.